Storage bus speeds with example storage endpoints. All figures here are the theoretical maximums for the busses using rough/easy calculations for bits/s<->bytes/s. Enough to figure out where the throughput bottlenecks are likely to be in a storage system. SAS devices may be dual ported (two connections to the device from the HBA(s)) – each with a 12Gbit connection giving a potential bandwidth of 2x12Gbit == 2.4Gbyte/s (roughly) per SSD device. An NVMe device directly attached to the PCIe bus has access to a bandwidth of 4GB/s by using 4 PCIe lanes – or 8GB/s using 8 PCIe lanes. 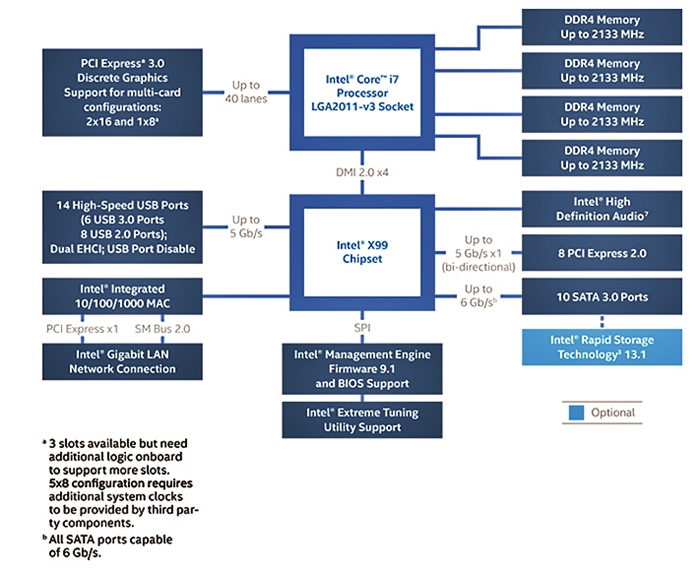 On current Xeon processors, a single socket attaches to 40 PCIe lanes directly (see diagram below) for a total bandwidth of 40GB/s per socket. I first started down the road of finally coming to grips with all the different busses and lane types after reading this excellent LSI paper. I omitted the SAS-2 figures from this article since modern systems use SAS-3 exclusively. Previous Previous post: Detecting and correcting hardware errors using Nutanix Filesystem.